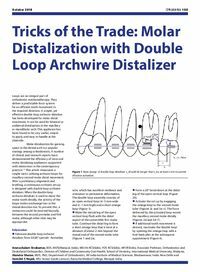 Abstract: Loops are an integral part of orthodontic mechanotherapy. They deliver a predictable force system for an efficient tooth movement in the required direction. Author notes: Arunachalam Sivakumar, BDS, MDS(Manipal, India), MOrth RCS(Edin), FDS RCS(Edin), MFDT(Edin), Associate Professor, Orthodontics and Dentofacial Orthopedics, Division of Children and Community Oral Health, School of Dentistry, International Medical University, Malaysia, Jitendra Sharan, MDS, PhD, Department of Orthodontics, All India Institute of Medical Sciences, Bhubaneswar, India. New Delhi and Vanishri S Nayak, MSc Senior Grade Lecturer, Kasturba Medical College, Manipal, India.